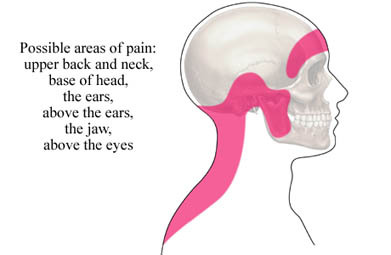 Tension headache refers to radiating, steady pain in the head, neck, or eyes that can be mild or intense. Tension headaches may be occasional or chronic. Tension headaches may occur when muscles in the neck, face, and scalp contract. In some cases, muscle contraction is the result of teeth grinding and jaw clenching. In others, it may be unknown. Some tension headaches are nearly constant, with daily pain that may vary in intensity. Other tension headaches only occur once in a while. Symptoms usually start slowly and build. You will be asked about your symptoms and medical history. A physical exam will be done. Diagnosis can be made on exam, based on specific features. The cause of the headaches however, may be more difficult to determine. A neurological exam may be done. There are no specific cures for tension headaches, but they can be managed. Therapies aim to stop the headache and reduce the frequency of future episodes. Note: Pain medications are most effective when taken at the first sign of pain and before it becomes severe. Overusing some over-the-counter medications may actually cause headaches. Continuous use of medications may create rebound pain when you stop taking the drug. Taking a caffeine supplement with your pain reliever may improve pain relief. Melchart D, Streng A, Hoppe A, et al. Acupuncture in patients with tension-type headache: randomized controlled trial. Brit Med J. 2005;331:376-379. NINDS headache information page. National Institute of Neurological Disorders and Stroke website. Available at: https://www.ninds.nih.gov/Disorders/All-Disorders/Headache-Information-Page. Accessed February 15, 2018. Tension-type headache. EBSCO DynaMed Plus website. Available at: http://www.dynamed.com/topics/dmp~AN~T114522/Tension-type-headache . Updated February 8, 2017. Accessed February 15, 2018. Tension-type headache. National Headache Foundation website. Available at: http://www.headaches.org/2007/10/25/tension-type-headache/ . Updated October 25, 2007. Accessed February 15, 2018. 12/16/2008 DynaMed Plus Systematic Literature Surveillance http://www.dynamed.com/topics/dmp~AN~T114522/Tension-type-headache : Jena S, Witt CM, Brinkhaus B, Wegscheider K, Willich SN. Acupuncture in patients with headache. Cephalalgia. 2008;28:969-979. 5/12/2014 DynaMed Plus Systematic Literature Surveillance http://www.dynamed.com/topics/dmp~AN~T114522/Tension-type-headache : Yancey JR, Sheridan R, et al. Chronic daily headache: diagnosis and management. Am Fam Physician. 2014 Apr 15;89(8):642-8. 2/4/2015 DynaMed Plus Systematic Literature Surveillance http://www.dynamed.com : Derry CJ, Derry S, et al. Caffeine as an analgesic adjuvant for acute pain in adults. Cochrane Database Syst Rev. 2012 Mar 14;3.